While building housing and offices like mad, in the late 1940s the company started to build the large community projects. The first big complex was the Dining Hall which incorporated the actual Dining Hall plus the bakery, the butcher shop, commissary services and all the various departments that would support the feeding of the employees in all three districts. Aramco was known for utilitarian architecture but when they designed the Dining Hall the architects went the extra riyal, actually many riyals, and incorporated the giant cubic façade for the facility that wasn’t really absolutely necessary. It was likely at the direction of the then current president James MacPherson who had a flair for the big gesture, but the Dining Hall’s entrance added another level of cement block faced with cut limestone that gave the facility a special grandeur that is now iconic. Nowadays the company would have found a sponsor and called it something like the Kaki Kola Convention Center, but being Aramco they settled for a giant DH logotype with the words Dining Hall. 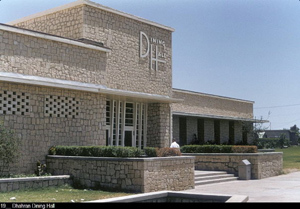 Since the facility handled the daily feeding of hundreds of employees as well as serving as the reception hall for countless dignitaries and because it was strategically located at the intersection of the entrance road from the main gate and King’s Road, the Dining Hall became the nexus of Dhahran. Meanwhile that giant cube over the entrance was always present and who could pass the Dining Hall without wondering what was inside that enormous volume. It was 1962. I was a sophomore in high school, returning student, the lowest level of the returning student pecking order, and was coming back from an excellent shop class that the company offered returning students to teach them how to design simple projects and use power tools like a table saw without cutting your thumb off. Meandering back from Aramco’s shop area as I approached King’s Road, I noticed that the company had torn out the vegetation along the western annex of the Dining Hall and replaced it with a trellis and new plants. It looked as if someone could climb up the trellis and get to the roof. I stopped and looked a little harder and noticed that there was a small door leading directly into the stone-clad cube over the entrance. I wondered where the door might lead to and then walked on. A couple of nights later I was hanging in the Teen Canteen with my friend Smith and a couple of girls. Mohammed Hampton who ran the Canteen was cleaning up for the day. The jukebox was out of order and I suspect that Mohammed had something to do with that. He had worked for the Hamptons for many years, so in addition to his wonderful personality he had an innate understanding of how to deal with American teenagers. God knows how many hapless Saudis had fled in horror from this particular demographic, but Mohammed had the right stuff. Except that he could listen to wild Bozuki music all day long, but Rock and Roll sent him up a tree. So it was quiet and we were sitting there drinking Pepsi and waiting for the next thing. The Canteen had a peculiar ritual wherein you would hang there and wait for the door to open. Someone would appear and they were either someone you wanted to see or someone else. The feeling was mutual and often the door opener would flee back into the night. No one opened the door that night, so we talked with Jenny and her friend Marie who hardly ever said a thing. But not Jenny. She had grown up next door to Smith, their parents were close friends and she was a year younger than Smith, but her goal in life seemed to be to make his life miserable – she was like his little sister. She was showing us her latest purchase from Khobar. “Let me see it,” said Smith. “Here look at it,” as she put her finger out for him to look. So I told them about this small door over the Dining Hall and they agreed that we should go check this out rather than grow old hanging around the canteen. So we set out. It was one of those nights that is so humid that the water vapor forms halos around the street lights. As we traveled down King’s Road we met two girls that were wandering around Dhahran in search of something to do. After a brief meeting they decided that the secret door was definitely worth pursuing and we continued on. Of course I had no idea what was behind the secret door but I was committed now, so we pressed on. As we approached the Dining Hall we all went into stealth mode. We scurried across the street, past the giant ficus tree that anchored the center of thousands of bus trips to Khobar and pressed ourselves against the wall of the building as if the searchlights of some maximum security prison were constantly searching for our presence. It was ten o’clock on a Monday night and there wasn’t a soul in sight. We slink over to the trellis and sure enough it was built out of welded pipe to Aramco’s industrial-grade specifications and a hippopotamus could scale it without a problem. I climb up the trellis and before you know it Smith, Jenny, Marie, the two girls and I are on the roof of the Dining Hall. We make our way over to the secret door and to my relief it is actually there. About three feet tall, the wooden door looks as if it hasn’t been opened ever. I turn the latch and tug at it, but it’s been painted over so many times it doesn’t budge. Smith who is larger than me by 40 pounds gives it a try and finally it swings open. I peer into a dark void. It looks as if there is a landing a few feet down, so I crawl down and after a minute or so I find a light switch and a dim overhead light illuminates the whole space. It’s like a huge cavern. There is a catwalk suspended from the roof and all around are vertical guy wires holding up the ducting and the false ceiling. The catwalk extends about twenty feet to an opening on the opposite wall. Who could resist? So we start across the narrow pathway. The lint and the dust of hundreds of shamaals curls up in faint clouds with every step and the vertical supports of the catwalk start to ping with tension. It occurs to me that maybe the catwalk isn’t designed to hold six people walking close together, so I ask everyone to spread out. We walk on, fascinated by all the guy wires hanging down to support the ceiling. It seems like hundreds of wires, undisturbed for ages, glistening in the weak light. With each step there is a groaning from the catwalk, occasionally there is a sharp noise but we make it to the other side of the cavernous cube. There is an opening and we pass through to a shallower, much wider void with what seems to be thousands of vertical wires holding up a great expanse of false ceiling and AC ducts. We are over the actual cafeteria headed for the door on the other side. Jenny stumbles in her Saudi Camp tire-soled sandals and Smith grabs her before she goes falling head-first through the false ceiling into the dining room. Smith realizes that whatever he does, he is doomed. I reach the door and open it to find a ladder that goes down below. I scramble down, the others follow and we are in the kitchen of the dining hall. It’s brightly lit and all buttoned up for the night, everything is put away, the counters are all cleaned up – it’s ship shape. However being teenagers we are always hungry, so we immediately look for something to eat. The refrigerators are locked and there aren’t any pantries we can get into, so we start poking around. The horizontal deep freezes that hold the ice cream aren’t locked. There are five gallon containers of Vanilla, Chocolate, Strawberry, Coffee and Hazelnut ice cream staring right at us. Jenny replies, “Who needs spoons?” and plunges her hand into the strawberry and pulls out a chunk of ice cream and proffers it to Smith. A feeding frenzy ensues, though nobody wants any coffee or hazelnut. Caught! For what? We were merely walking across the roof of the dining hall, found an open door and strolled into a maze and ended up in the kitchen. It wasn’t our fault that we were famished after all that effort. Nonetheless, even though we are absolutely blameless of any wrong doing, we know that we had better leave. Being smarter than the rest of us, Jenny takes a wet paper towel and smooths over our claw marks in the ice cream. We make our way up the ladder, across the expanse of the cafeteria ceiling, through the opening, back across the great cavern of the entrance and out the secret door onto the roof. Carefully we descend the trellis and step out on the lawn. A taxi cab passes but he could care less, and the night is as still as when we entered. She says, “You’ll be lucky if I ever talk to you again,” and marches off with Marie. The two other girls have had a great time for a Monday night and drift away. Smith and I discuss the evening’s events and he heads off for Sixth street while I walk down King’s Road to my house. About half way down the length of the dining hall complex I start laughing. I can just see some grizzled geologist making his way over from Exploration for lunch at the Dining Hall. A hot, open-faced Turkey sandwich with mashed potatoes, followed by a cup of coffee and a bowl of strawberry ice cream. And on the second bite, how lucky he will be to not crack a molar on a scarab beetle.